Counseling Psychology 3 Edition Developed as the first extensive overview of counseling psychology, this detailed and engaging work has been an invaluable resource for everyone from undergraduate students to veteran practitioners and researchers for over 20 years, even those working in other disciplines. This long-anticipated 3rd edition has been updated to incorporate contemporary research and theoretical approaches, including feminist multicultural counseling. This book has also been reorganized into three distinct sections that provide readers with easy access to specific information. 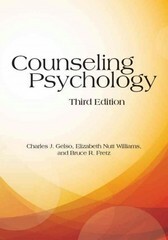 The first section provides a general overview of counseling psychology, including its guiding principles and ethics, such as the counseling psychologist's dual role as a scientist-practitioner and the focus on clients' strengths; the history and foundational research behind the field; and distinctive and shared qualities compared to other psychological disciplines. The second section examines the practice of counseling psychology, discussing such topics as the counselor-client relationship, assessment and testing methods, group and family counseling, and the four dominant therapeutic approaches within the field - psychoanalytic, cognitive-behavioral, humanistic, and feminist multicultural. All of this information culminates in the third section with advice about training, graduate and post-graduate work, and career development, providing clear applications for readers who wish to progress as counseling psychologists.